Starting to settle into the idea of chillier weather and pigskin Sundays? Even Arizona can fall prey to Old Man Winter, so before the temperatures start to fall, take this time to do some autumn maintenance around your property. Planting sod can bring new beauty to your lawn just in time for the changing seasons. Clear the Area. You may not even realize how much stuff has accumulated in and on your lawn area over time. Any materials and objects need to be removed. Items such as wood, bricks, and cement can often make themselves part of the general scenery, so take note and move items that you need to. Do a thorough check for stumps, rocks, boulders, stones, and other natural debris that you might not notice upon first check, and remove those items too. Grade the Space. Although Arizona isn't necessarily known for ample amounts of rain, you'll want to head off any drainage problems long before they have a chance to form. Slope the grade away from the foundations of buildings will help eliminate drainage problems on the property. Take care to reduce or remove severe slopes and low-lying areas which have potential to hold water in the future. Those spots should be filled upfront so the soil has a chance to settle. Toward the end of the process, you might need to add more filler. If your property is on the smaller size, you can grade with hand tools. For a larger space, you'll want to use a tractor-mounted blade or box for the work. Keep an eye out for newly uncovered debris that will need moved. Prepare the Root Zone. The root zone is the receiving end of your sodding project. As such, you'll want to take the time to prepare it properly so it's ready to help its new sod covering settle in easily. In particular, pay attention to the pH level of the soil, and make modifications, if needed. Acidic soils that measure in at a pH level of 6 or below can be leveled out with the use of lime. Alkaline soils, those measuring in at a pH of 7.5 or greater, can benefit from the help of sulfur or gypsum. The type and amount of corrective component requires a science that's often best assessed or aided by a turf professional. Fertilize Sparingly. 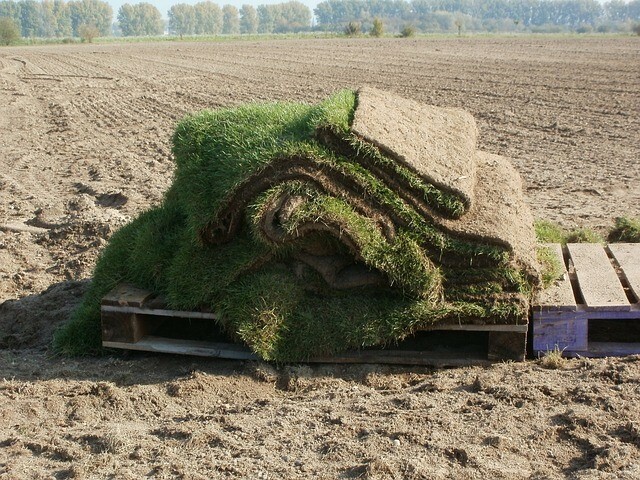 You might be inclined to feed your fresh sod tons of fertilizer in hopes of getting it going and growing, but the truth of the matter is that fertilizing fresh sod with fervor can damage your investment. Go light on the nitrogen, using a formula of no more than one pound per 1,000 square feet of lawn. Beginner fertilizers high in phosphates can be beneficial for the initial part of the process. Work your fertilizer into the top 3-4 inches, taking care not to damage the delicate roots beneath this threshold. Deploy the Lawn Roller. It's time to check for low spots that need to be filled to match the surrounding grade. Allow the site to settle, and, if possible, employ irrigation water to assist with the settling process. Any spots that reveal inconsistency in grade should be corrected at this phase, readying your property for a happy green scene for years to come!